The students who teach at private universities can now call their academic labor an actual job, and bring union solidarity to their scholarly passion. On Tuesday, the National Labor Relations Board (NLRB) ruled that graduate students, who contribute much of the research and teaching labor in private higher education, are now worthy of the rights of workers. In a 3-1 ruling in favor of Columbia teaching and research assistants, who organized as Graduate Workers of Columbia affiliated with United Auto Workers (GWC-UAW), the board overturned a 2004 decision that sided with university administrators. Tuesday’s decision acknowledges the students’ full collective-bargaining rights under the National Labor Relations Act. At a time when higher education is in crisis over unsustainable costs and precarious workforces, the win for organized labor marks a powerful progressive victory in an increasingly insular academic climate. The students at Columbia seek a collective-bargaining unit for graduate and undergraduate teaching and research assistants, to tackle issues ranging from unlivable wages to the lack of a clear grievance process. But the key demand is simply fair representation at an institution to which they’ve devoted their careers as both students and workers. Just ask any grad student as they rush from their day shift teaching undergraduate literature to a night shift burrowed in the library archives. If their double-duty job is stressful enough to burn out on, it’s serious enough to merit union rights. The petition draws on the framework established by graduate-student unions at public-university campuses, which have long been able to organize under state labor law, not constrained by the National Labor Relations Act. Columbia’s union bid is also unique in that the proposed bargaining unit encompasses both graduate instructors and undergraduate teaching assistants. Graduate workers on other private campuses, including Yale University, Harvard, and Duke, have campaigned for years alongside GWC. UAW, UNITE HERE, and SEIU have spearheaded major campus labor campaigns, with grassroots support from students and faculty, which have shamed university administrators for repeatedly refusing to voluntarily recognize their unions. Currently, New York University graduate workers have formed the only union at a private campus that has gained voluntarily recognition, as GSOC UAW. The Columbia students’ hard-fought NLRB win, which now sets in motion the process for a formal union vote that would essentially force the university to accept the union, is buoyed by solidarity from other activist campaigns on campuses nationwide, from Black Lives Matter to the Fight for 15 wage campaigns, along with an explosion of adjunct-professor unionizing, spearheaded by SEIU and other unions. 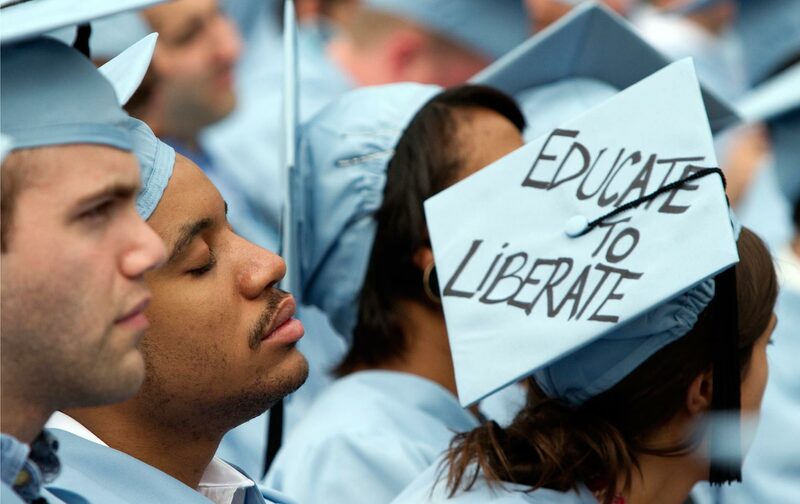 The legal victory in many ways just affirms graduate workers’ success at the grassroots. Following the ruling, Columbia history graduate student Paul Katz said that the GWC effectively already acts as a union, engaging in advocacy campaigns that have helped push through policy changes like stipend raises and improved family-leave and childcare benefits for campus workers. Columbia raised fears that a union would interfere with academic policies. However, the students argue they need a union precisely to protect the integrity of their academic work, since a clearly defined collective-bargaining process would provide the security of knowing they would not face retaliation or academic demotion over, for instance, a dispute with an adviser or a labor grievance. Indeed, if a university can’t handle those dual roles as an educational institution and a workplace, it arguably has no business exploiting grad students to carry out “one of a university’s most important revenue-producing activities.” For all the profitability of this supposedly “nonprofit” higher-education model, why not allow student workers living on ramen to negotiate their fair share? Julie Kushner, director of UAW Region 9A, said that following the NLRB ruling, other institutions ought to voluntarily honor students’ unionization campaigns—not just as a matter of law but of serving the overarching mission to promote an open, equitable learning community. Academic freedom is only possible in a context of economic security and social rights. Now students struggling for a more democratic higher-education landscape are one step closer to reconciling their work ethic with their academic ideals.